Ehrlichiosis is an emerging disease caused by a rickettsia: a type of bacteria that infects dogs, people, and less commonly cats. For dogs in North America and world-wide most cases of ehrlichiosis are caused by Ehrlichia canis (canine monocytotropic ehrlichiosis).1 Transmission is always from tick bites. Although people and dogs often live in close relationship to, and may come in contact with, the same species of tick, E. canis infections in people are thought to be rare. E canis is most often transmitted by the brown dog tick (Rhipicephalus sanguineus). Infection likely requires several hours of tick attachment to the dog, and clinical signs may not appear for 1—3 weeks or longer. There are 3 differing stages of the disease in dogs. Less commonly, infected dogs can also exhibit inflammatory diseases of the eye and nervous system. The severity of the illness may be influenced by the disease strain, the dog’s immune status, and the presence of coinfections with other tick-borne or flea-transmitted pathogens. Progression to subacute and chronic disease may be attributed to an ineffective immune response on the part of the dog. 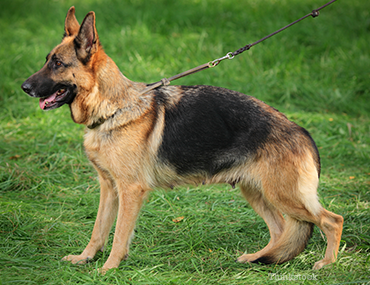 German Shepherds appear to be predisposed to the severe, chronic form of disease. A presumptive diagnosis may be made when clinical signs and a history of exposure to the tick vector lead to a high level of suspicion. Monocytes, a kind of white blood cell, can occasionally help with diagnosis. Confirmation may require using an anitbody test such as an ELISA that also looks for Anaplasma, Lyme disease, and heartworm infection. Polymerase chain reaction (PCR) to look for the organism’s DNA footprint is also commonly available. Treatment should be maintained for at least 4 weeks. There is no available vaccine and the best ways to prevent these infectious bites are with year-round tick repellents, thorough body checks after being outside, and proper removal of ticks. Once geographically limited, Ehrlichia spp. are now wide spread in distribution, and they are of particular concern in Gulf Coast states and through the Southeastern United States. The Companion Animal Parasite Council recommends that all dogs be tested yearly for tick-borne diseases and that all dogs be treated with effective tick-control agents year-round. Comprehensive screening is important to find coinfections and to determine the success of prevention strategies. 1. Little SE. Ehrlichiosis and Anaplasmosis in dogs and cats. Vet Clin North Am Small Anim Pract. 2010, 40(6): 1121-1140. 2. Harrus S, Waner T, Neer TM. Ehrlichia and anaplasma infections: Ehrlichia canis infection. In: Greene CE, ed. Infectious Diseases of the Dog and Cat. 4th ed. St Louis, MO: Saunders; 2012:227–258.